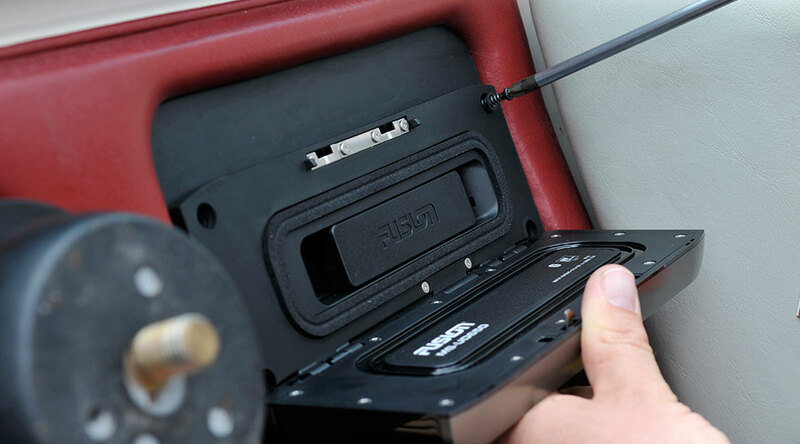 On-water entertainment systems such as the FUSION 650 pictured above are built to support pocket media like your Apple or Android smartphone. Added features including Pandora, satellite radio and Bluetooth technology make it easier than ever to take your fishing mix out on the water. 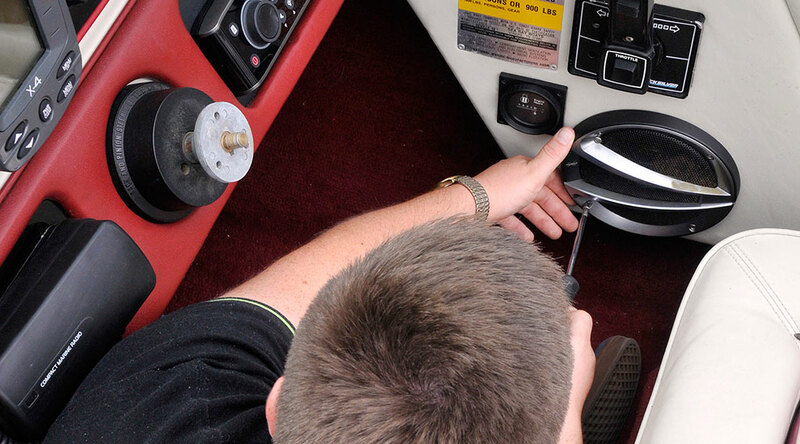 If you haven't already upgraded the audio system on your boat, this guide will walk you through the process. 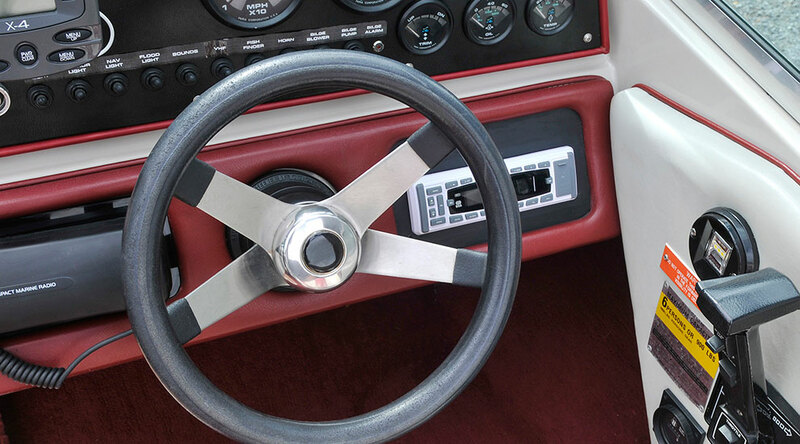 You might think a traditional car stereo and speakers would be adequate for life on the water, but that couldn't be further from the truth. The complexities of operating high-quality audio in the harsh saltwater environment are what the team from FUSION specializes in. 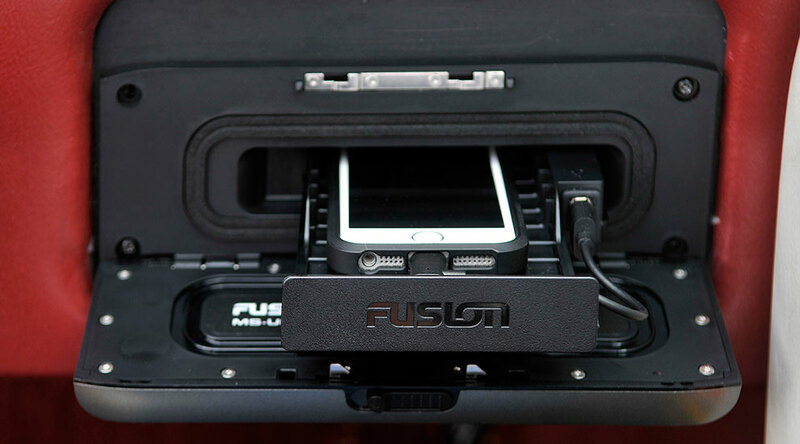 If you're serious about music and want to keep your smartphone safe on the water, we suggest you choose FUSION. First Step: Out with the old. Before doing anything, disconnect the batteries on your boat. 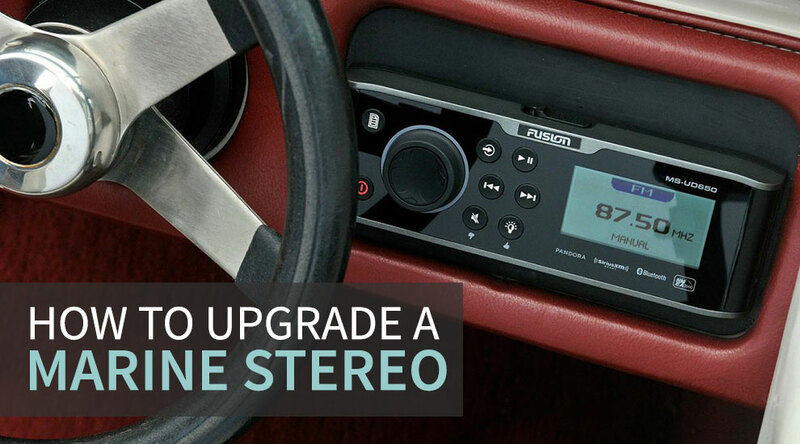 Depending on the stereo you wish to remove there will be various screws and wires to unplug before you can replace it with a new FUSION system. 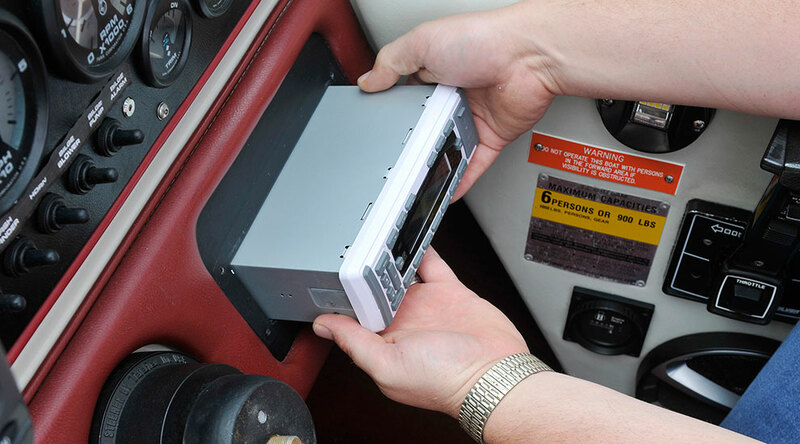 Once you have unscrewed and unplugged the stereo simply pull out it out. To make the install a bit easier, we removed the steering wheel. Notice the hole in the chassis (above left) and clearly unprotected circuit board (above right). These are hot spots for water penetration and over time regular exposure to the marine environment will make this stereo inoperable. The FUSION MS-UD650 system is designed specifically for the marine environment. This model features an internal UNI-Dock with three connector cables to accommodate any iPhone and a Micro-USB for Android and Windows smartphones. The dock will house anything as large as an iPhone 6 or Samsung Galaxy with ease, but FUSION includes an external USB cable connector for the iPhone 6 Plus or Samsung Note. They system also has Bluetooth audio streaming capabilities. The actual chassis is a standard size, able to fit into the space of any standard stereo, but you will need to make sure you have enough space for the larger front panel. You'll also need space for the front face to open. Consult the user manual for product dimensions. The fully sealed chassis and aluminum side-fin heat sink protect the stereo from the environment and keep it operating efficiently with less current draw, thanks to an integrated Class-D amplifier. All screws and back plates are made from stainless steel and the chassis is built from a glass composite to eliminate fizzing from dissimilar metals. The chassis is electrically isolated which is important when installing in a metal hull. 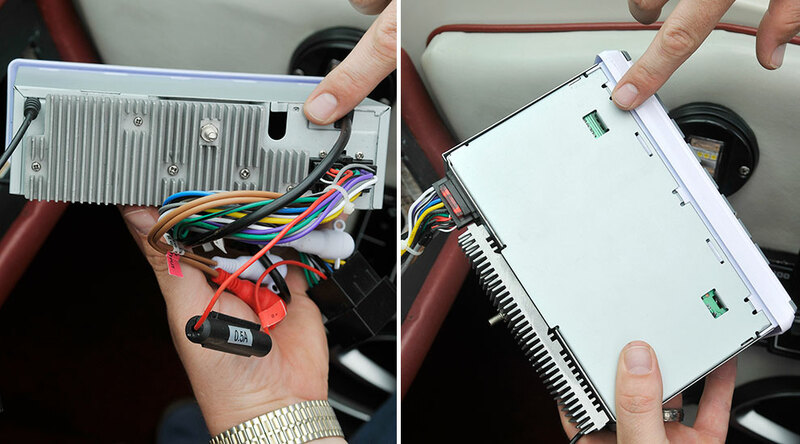 FUSION provides a full wiring harness to make installation a breeze. All cables are color coded and labelled. RCA line out connections are provided for amplifier connectivity and a NMEA 2000 drop cable is integrated for direct connection to a NMEA 2000 network. This particular model the MS-UD650 is a three-zone system which means you can create differing levels of volume in separate areas of the boat. On a smaller boat you might think this isn't really necessary, but speakers up in the tower or on the bow in a large center console will need to run considerably louder. For each zone, FUSION includes a Line Out and Subwoofer Line Out to connect external amplifiers. Securing the stereo is simple. Four screws are provided and a gasket plate seals the chassis. The stainless steel locking mechanism and water-resistant rubber seal inside the front face ensure a secure lock, preventing water for getting inside the unit. The Internal UNI-Dock features a ribbed rubber bottom plate to secure the smartphone inside while allowing air to flow around the device to keep it cool. The UNI-Dock will also charge your device and protect it as you play tunes. If you need to remove the phone, FUSION offers an app that lets you use Bluetooth to control the stereo. 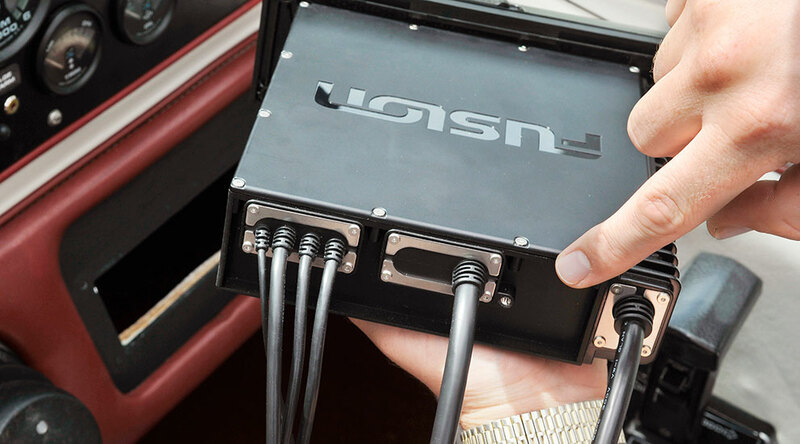 The NMEA certified system lets you connect other FUSION stereos together, and FUSION-Link connectivity is supported by all the major electronics manufacturers so you can control the audio right from your Multi-Function Display on the helm. 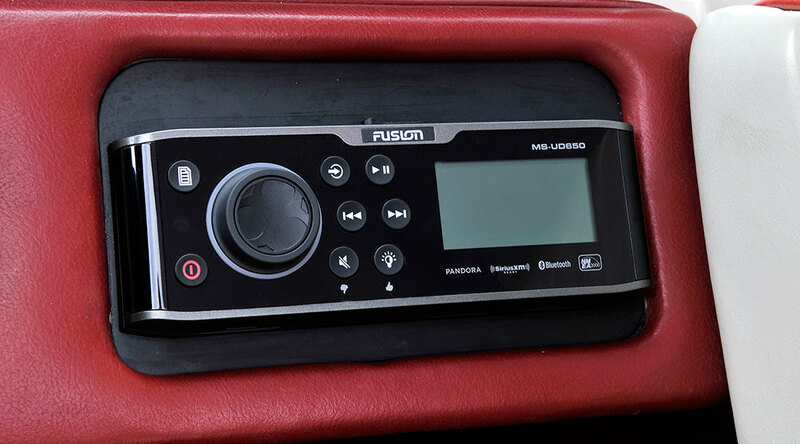 FUSION's large daylight-viewable display, large keys and navigation encoder make operating the stereo very easy. Whether on choppy seas or a calm channel, the FUSION interface is so intuitive you'll be skipping tracks and thumbing through Pandora stations in no time. With the stereo installed, it's time to complement it with some FUSION True-Marine speakers capable of delivering high-quality sound, even when the waves are crashing. Start by removing the old speakers on the boat. Note the difference between a standard speaker and a FUSION marine speaker. You can see the exposed wires and connections on the old speaker. The back of the speaker offers no protection against the environment. FUSION seals the magnet and crossover components in a chassis made from ASTM certified plastics to withstand UV and Salt Fog exposure. FUSION has incorporated gold-plated terminals for the best connection possible and cable retention clips to remove pressure from the terminals. 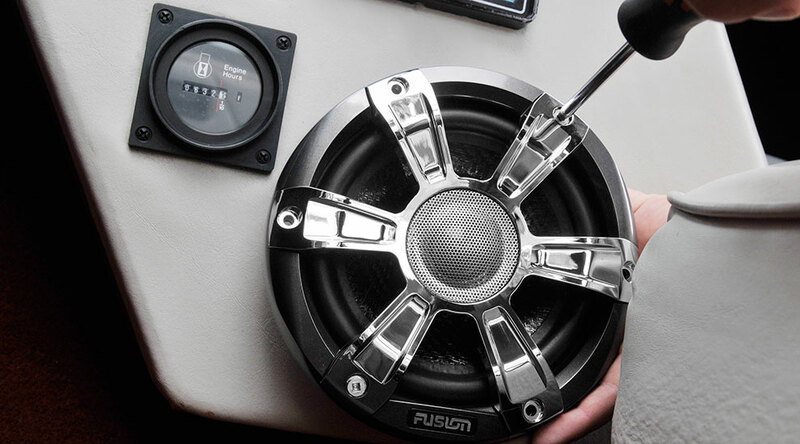 The speaker shown is FUSION's Signature Series 6.5" Coaxial LED sports speaker. The integrated LED lighting creates a blue or white illumination effect around the speaker. To connect the LED lighting FUSION provides additional cable and new terminals on the opposite side to what is shown here. Simply wire the illumination cables back to a 12-volt source. 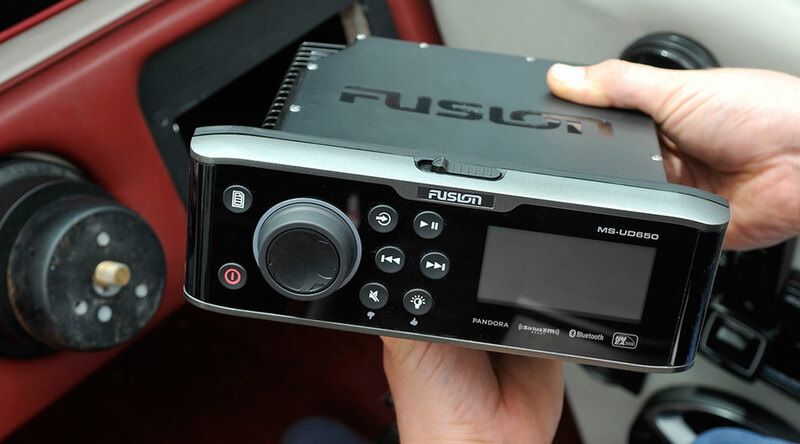 FUSION offers a voltage regulator, which can be installed to help maintain a seamless level of brightness across the boat and switch between colors. 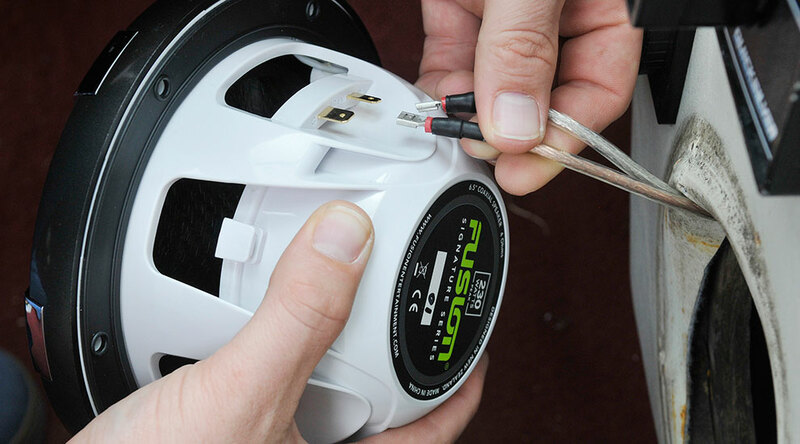 When fitting the new FUSION Signature speakers you may need to make adjustments to the cutout or screw-mounting points. Consult the user manual for cutout dimensions and product depth. 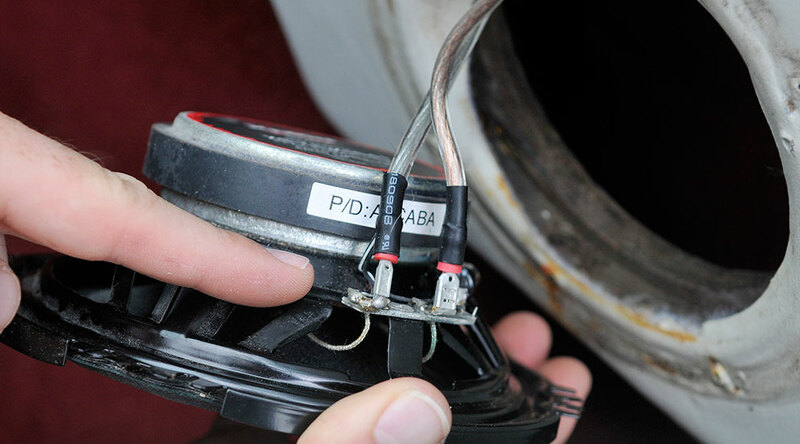 Once you have adjusted the cutout and connected all the speaker and LED wires, you can start to screw the speaker into place. Once installed the speaker is IP65 water resistant, able to withstand water ingress without disturbing the audio. 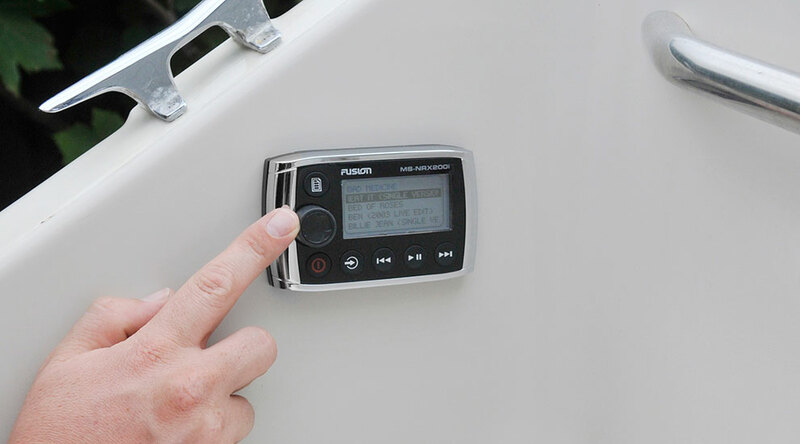 A wired remote control is a perfect solution for adding localized control of the audio to a defined area on the boat such as the cockpit. FUSION's MS-NRX200i wired remote is a NMEA 2000 certified product. 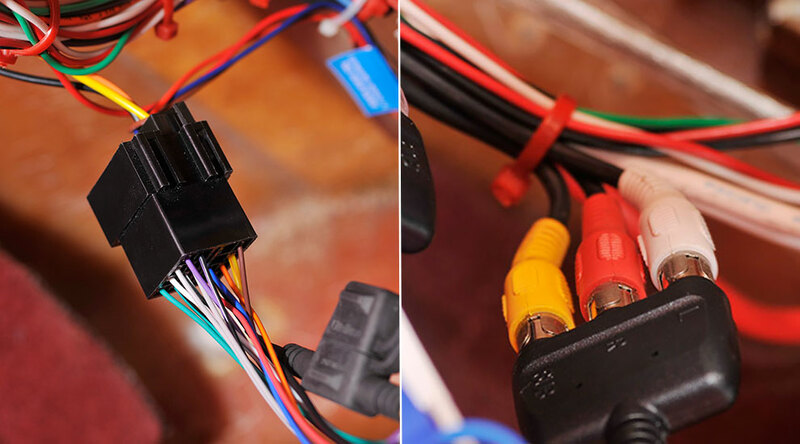 Included with the remote control are all the cables and connectors needed to connect to a standard NMEA 2000 network. Like all the products featured here in this installation guide the MS-NRX200i remote, SG-SL65SPC speakers and MS-UD650 stereo come protected by FUSION's True-Marine Three-Year warranty. For more info on FUSION visit FUSIONentertainment.com.